The first proposals for a metro system in Bucharest were made in the early part of the 20th century, by the Romanian engineers Dimitrie Leonida and Elie Radu. The earliest plans for a Bucharest Metro were drafted in the late 1930s, alongside the general plans for urban modernization of the city. The outbreak of World War II, followed by periods of political tensions culminating with the installation of communism, put an end to the plans. By 1970, the public transport system (ITB) was no longer adequate due to the fast pace of urban development, although the system was the fourth-largest in Europe. A commission was set up, and its conclusion pointed to the necessity of an underground transit system that would become the Bucharest Metro. The construction on the new metro system started on 20 September 1975. The network was not built in the same style as other Eastern European systems. Firstly, the design of the stations on the initial lines was simple, clean-cut modern, without excessive additions such as mosaics, awkward lighting sources or excessive decoration. The main function of the stations was speed of transit and practicality. Secondly, the trainsets themselves were all constructed in Romania and did not follow the Eastern European style of construction. Each station usually followed a colour theme (generally white – in Unirii 2, , Victoriei 1, Lujerului; but also light blue – in Obor, Universitate, and Gara de Nord; orange – in Tineretului; green - in Grozăvești), and an open plan. No station was made to look exactly like any other. Despite this, many stations are rather dark, due to the policies of energy economy in the late 1980s, with later modernisations doing little to fix this problem. Bucharest being one of the largest cities in the region, the network is larger than those of Prague or Budapest. When the planned new line-extensions are finished, they will increase the system length to more than 100 km, with about 80 stations. Lines M1 and M3 have been sharing the section between Eroilor and Nicolae Grigorescu. Large stations which connect with other lines (such as Victoriei) have two terminals, and each terminal goes by a different name (Victoriei 1 and Victoriei 2). On the official network map, they are shown as two stations with a connection in between, even though, in practice (and in trip planners), they are really only one station with platforms at different levels. There is one exception: Gara de Nord 1 and Gara de Nord 2 are separate stations (although linked through a subterranean passage, the traveller is required to exit the station proper and pay for a new fare at the other station, thus leaving the system), passengers being required to change trains at Basarab. Generally, the underground stations feature large interiors. The largest one, Piata Unirii, is cathedral-like, with vast interior spaces, hosting retail outlets and fast-food restaurants and has an intricate network of underground corridors and passageways. Metrorex is the Romanian company which runs the Bucharest Metro. It is fully owned by the Romanian Government through the Ministry of Transportation. There were plans to merge the underground and overground transportation systems into one authority subordinated to the City of Bucharest, however these plans did not come to fruition. As of 2018, the entire network runs underground, except for a short stretch between Dimitrie Leonida and Berceni stations on the southern end of M2 line. The network is served by five depots, 2 being located above ground (IMGB and Industriilor) and three underground (Ciurel, Străulești and Pantelimon) and by additional smaller works at Gara de Nord and Eroilor stations. 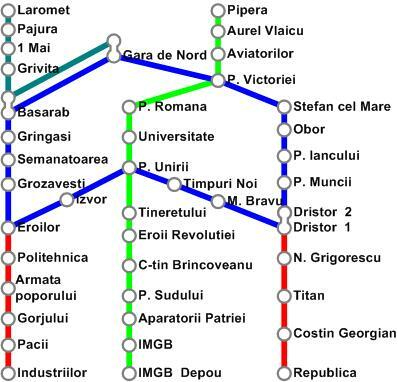 There are two connections between the Metro network and the Romanian Railways network, one at Berceni (connecting to the Bucharest Belt Ring), the other at Ciurel (connecting via an underground passage to the Cotroceni-Militari industrial railway). The latter connection however is unused and mothballed. The metro network and the national rail network share the same track gauge (1,435 mm / 4 ft 8 1⁄2 in) and loading gauge but not the same electrification system (the metro uses 750 V DC whereas the Romanian Railways use 25,000 V 50 Hz AC) making it possible for new metro cars to be transported cross country as unpowered railway cars. The network is powered by a bottom-contact third rail system except in works, depots and some tunnels where a catenary system is employed. M1 Line: between Dristor and Pantelimon – the first line to open (in 1979). It is circular with a North-Eastern spur. Part of its tracks are shared with M3 (7 stations). M2 Line: between Pipera and Berceni opened in 1986, completed in 1988; Runs in a North-South direction, crossing the center. M3 Line: between Preciziei and Anghel Saligny opened in 1983, completed in 2008; Runs in an East-West direction, south of the center. Shares part of its tracks with M1 (7 stations). M4 Line: between Gara de Nord and Străulești opened in 2000, completed in 2017. There are multiple signalling systems used. Line 2, the first one that has been modernized, uses Bombardier's Automatic Train Control system. It ensures the protection (Automatic Train Protection) and operation (Automatic train operation) of the new Bombardier Movia trains. The system uses an IPU (Interlocking processing unit), TI21-M track circuits and EbiScreen workstations. Signals have been kept only in areas where points are present, but only use a white light, meaning that the route has been assigned and the driver can use cab signalling. Trains are usually operated automatically, with the driver only opening and closing the doors and supervising the operation. Other features include auto turnback and a balise system, called PSM (precision stop marker). This ensures that the train can stop at the platform automatically. On line 3, the ATC system has been merged with the Indusi system. Signals are present in point areas and platform ends. Along with the three red-yellow-green lights, the white ATP light has been added. Optical routes can be assigned, meaning that a train gets a green light (permission to pass the signal) only after the next signal has been passed by the train ahead, or a yellow light, meaning that the signal can be passed at low speed. Automatic Block signals have been removed. Line 4 uses Siemens's (formally Invensys Rail Group) TBS 100 FB Automatic Train Control system. Line 5 will use Alstom's Urbalis 400 Communications-based train control system. Trains run from 5 AM to 11 PM, every day. The last trains on M1, M2 and M3 wait for the transfer of the passengers between lines to complete, before leaving Piața Unirii station. At rush hour, trains run at 4–6-minute intervals on lines 1 and 3, 7-minute on line 4 and at 1–4-minute intervals on line 2; during the rest of the day, trains run at 8-minute intervals on lines 1 and 3, 9-minute intervals on line 2 and 10-minute intervals on line 4. Public transport in Bucharest is heavily subsidized, and the subsidies will increase, as the City Council wants to reduce traffic jams, pollution and parking problems and promote public transport. Like the RATB, the metro can get crowded during morning and evening rush hours. The network uses magnetic stripe cards, that are not valid for use on trams, buses or trolleys . Older-style metro cards are not linked with personal data or usage data in a central database and thus they guarantee anonymity of the travel. Because of that, however, if a metro card is lost or damaged, the traveler cannot be reimbursed for the unused trips. M5 Line: Construction on the first 7.2 km (4.5 mi), ten stations, section, between Drumul Taberei and Eroilor, with a branch to Valea Ialomiței, began in 2011; a further extension of 11.5 km (7.1 mi) to Pantelimon is approved. Line M7; it is supposed to run 25 kilometres (16 mi) from Bragadiru to Voluntari. Line M8, the south half ring. Its route has not been fully planned yet, but it will run through Piața Sudului and end at Crângași and Dristor stations. An extension of the Line M3 is also planned for 2030. Giulești between Crângași and Basarab. CAF - 24 trainsets (144 cars), built between 2013 and 2016, used on M2. The Romanian designed Astra IVA trains, built in Arad, are made up of various trainsets (rame) connected together. Each trainset is made up of two permanently connected train-cars (B'B'-B'B' formation) that can only be run together. The Astra IVA rolling stock is approaching the end of its service life, so it is gradually being phased out. They are used on the M4. The Bombardier Movia 346 trains are made up of six permanently connected cars, forming an open corridor for the entire length of the train (2'2'+Bo'Bo'+Bo'Bo'+Bo'Bo'+Bo'Bo'+2'2' formation). Bombardier trains are used on all lines, except line M4. In November 2011, Metrorex signed a €97 million contract with CAF for 16 metro trains (96 cars), with options for a further 8 sets (48 cars). The 114m-long six-car trains will be assembled in Romania. They each accommodate up to 1,200 passengers and are made up of four powered and two trailer vehicles. As of November 2014, all trains have been delivered and all 16 of them entered in service. As the CAF trains enter service, all of the Bombardier stock will be moved for use on line M3, according to Metrorex's plans to replace all of the old Astra IVA stock on the entire network. In November 2014, Metrorex signed an additional €47 million contract with CAF for 8 metro trains. As of 2018, 24 CAF trains are in use, exclusively on line M2. The subway livery for Bucharest is either white with two yellow or red horizontal stripes below the window for the Astra trains, stainless steel with black and white for the Bombardier trains, or stainless steel with blue and white for the CAF trains. All trains run on a 750 V DC third rail, or an overhead wire (in maintenance areas where a third rail would not be safe). Maximum speed on the system is 80 km/h (50 mph), although plans are to increase it to 100 km/h (60 mph) on M5, a new line currently under construction. Bucharest Metro was the only one in the world that operated with passengers during testing. In the 1980s, the speed of building the network (4 kilometers / year) placed the BucharestMetro on the second place in the world, after Mexico City Metro. The shortest distance between two adjacent stations is between Gara de Nord 2 (M4) and Basarab 2 (M4) and is 430 meters. Bucharest Metro was built with Romanian forces and resources. The countries that have succeeded this: Germany, France, United Kingdom, United States, Soviet Union, China and Romania. The effort was colossal for that moment. ^ a b c d e f g h i "Metrorex - Network features". Metrorex. Retrieved 7 May 2014. ^ a b "Metrorex - Map" (in Romanian). Metrorex. Retrieved 7 May 2014. ^ Călin Cociș (9 September 2015). "Topul stațiilor de metrou din București, după numărul de călători. Stația SURPRIZĂ de pe locul I". B365. ^ a b c d "Metrorex - Metrorex history". Metrorex. Retrieved 8 May 2014. ^ a b "30 de ani de exploatare a metroului bucurestean" (in Romanian). agir.ro. August 2009. ^ "Metroul bucureştean, 10 lucruri pe care ar trebui să le cunoşti" (in Romanian). historia.ro. Retrieved 29 July 2014. ^ "Bucureştiul mileniului trei imaginat în 1930" (in Romanian). cotidianul.ro. Retrieved 29 July 2014. ^ a b "Ce nu știați despre metroul bucureștean: De la planurile din 1909, la Magistrala 7" (in Romanian). 19 November 2012. Retrieved 29 July 2014. ^ "Istoric Metroul bucureştean" (in Romanian). metroubucuresti.webs.com. Archived from the original on 9 August 2014. Retrieved 29 July 2014. ^ "Metrorex - Schedule". Metrorex. Retrieved 7 May 2014. ^ "Metrorex - Fees". Metrorex. Retrieved 7 May 2014. ^ "Bucuresti metro expansion tendering". Railway Gazette. 22 February 2011. Retrieved 27 February 2011. ^ Vlad Ignat. "Păianjenul Metrorex schimbă harta Capitalei. Bucureştenii se mută în subteran, din 2030" [Metrorex's Web Project changes the map of Bucharest. Bucharest moves underground by 2030]. Adevărul (in Romanian). Retrieved 7 May 2014. ^ "Metroul din Bucureşti, singurul din lume care a funcţionat cu călători în perioada de probe | Bucurestii Vechi si Noi". www.bucurestiivechisinoi.ro (in Romanian). Retrieved 7 July 2018. ^ Juncu, Diana. "10 lucruri pe care nu le știai despre metroul bucureştean". OBSERVATOR.TV. Retrieved 7 July 2018. Wikimedia Commons has media related to Bucharest Metro. 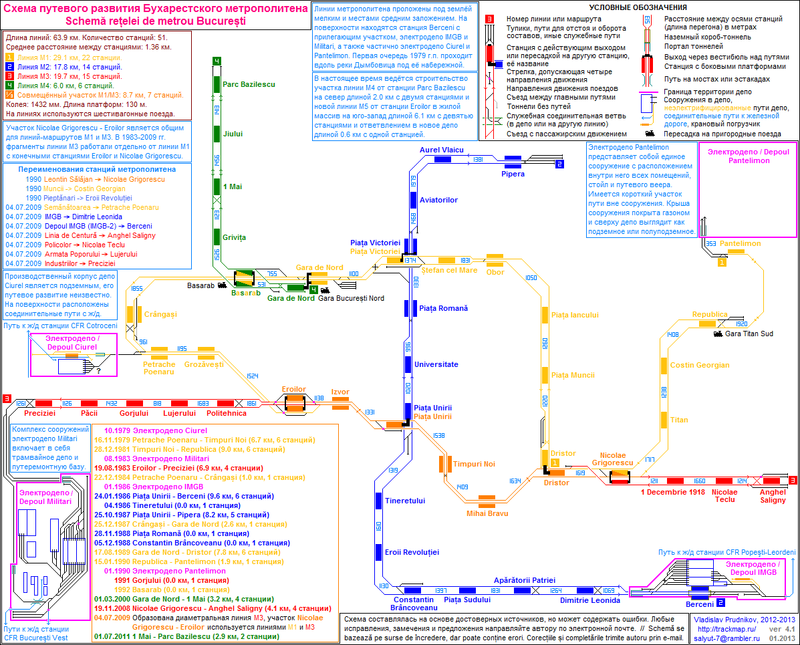 Stations and lines in italics are planned or under construction. This page was last edited on 18 April 2019, at 14:26 (UTC).